Although watermelon and feta make a delicious summer salad, I’ve found a combination I like even better – peaches and feta. 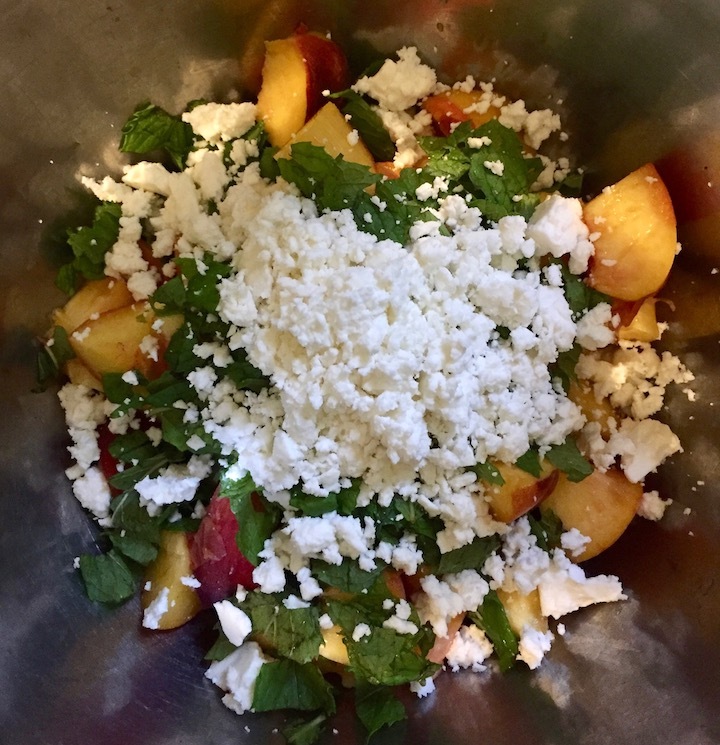 I discovered it rather haphazardly when visiting a friend who had asked me to bring feta, perhaps to make said watermelon salad, and peaches, since they are in season and available locally. We hadn’t used either by the last night when suddenly it occurred to me that they might go very well together. I added some fresh mint, a handful of fresh cilantro and squeezed in a juicy lime. We ate every bite! 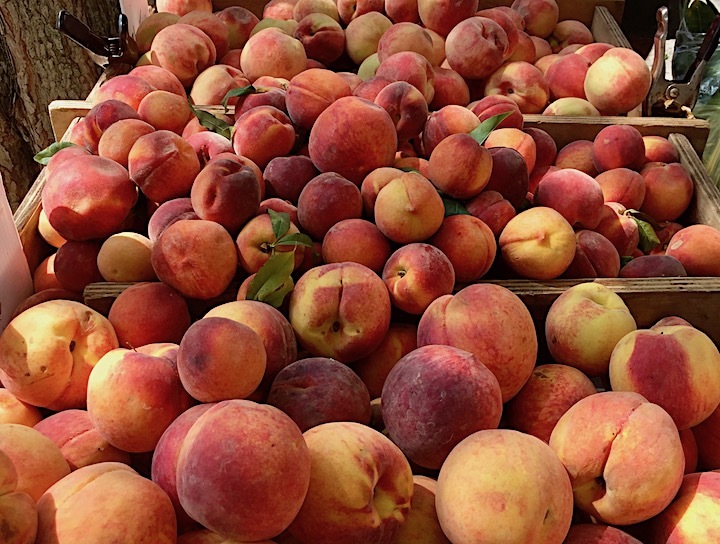 Local peaches are at their best in August until mid-September. 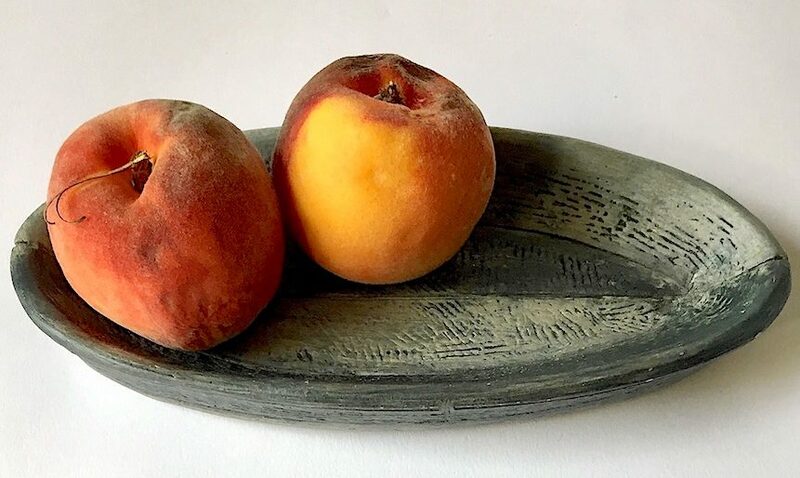 White peaches are a less acidic but yellow peaches have a nice tang – both delicious. Mint or cilantro alone would have been sufficient and when I tried it at home with mint and basil, I didn’t like it as much. The basil took over. Somehow the cilantro was more refreshing. If you don’t like cilantro, try mint or parsley. I used a Greek sheep milk feta from a neighborhood market, but the mild domestic cow milk feta that is widely available in grocery stores would work perfectly well. If you want your salad a bit less sweet, add some chopped scallions or red onion. A vegan version could substitute white beans or pine nuts plus green olives for the cheese to create a different but still tasty meal. If you don’t have a lime, try white balsamic vinegar. 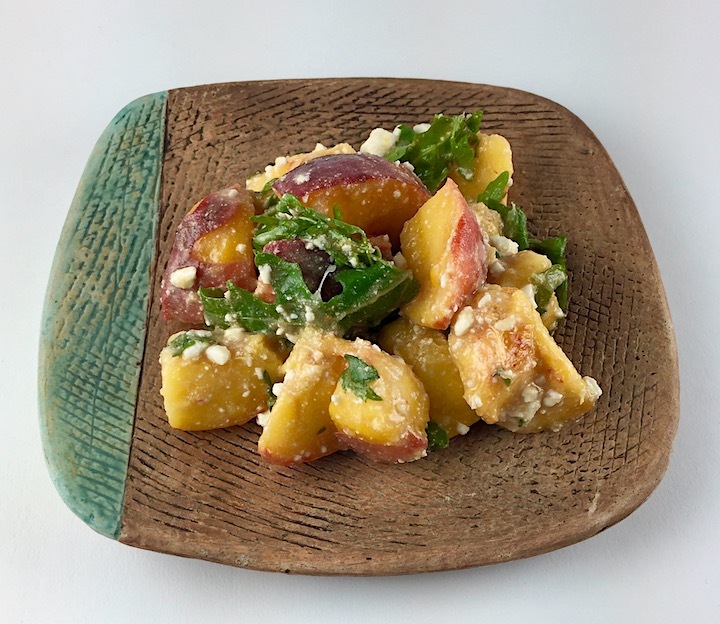 This peaches and feta salad is perfect for a light meal on a hot day when turning on the stove would be torture. 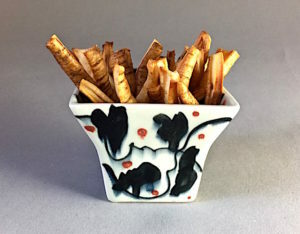 Just add serve it with some crackers or chips and you’ll be have a cool, satisfying dish. 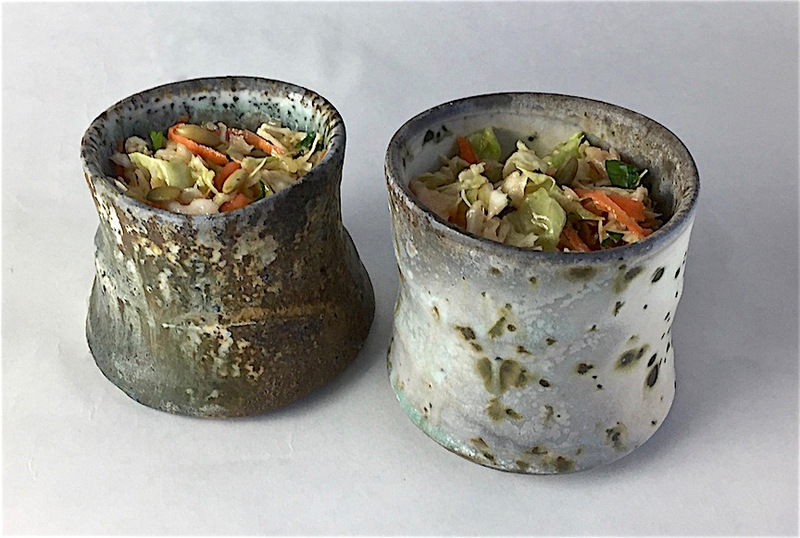 I took a test run of this recipe to meet a friend for lunch and, once again, every bite was devoured. Make it and see if the same thing doesn’t happen to you. Squeeze in one juicy lime (3-4 Tablespoons) and toss. If you want some greens, add a couple of cups of arugula and toss or serve atop greens. One of the simplest and most universally liked dishes I serve at parties or take to a potluck is a wild rice salad with walnuts, cherries, parsley and an orange raspberry vinaigrette. 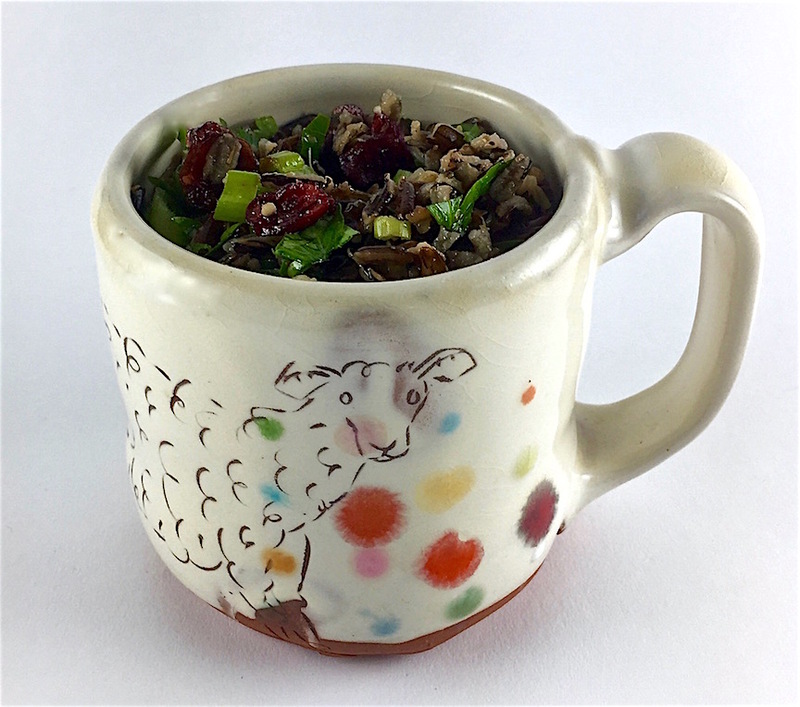 All you do is mix together the cooked wild rice with finely chopped raw vegetables, a dried fruit, nuts or seeds and toss with an easy dressing. 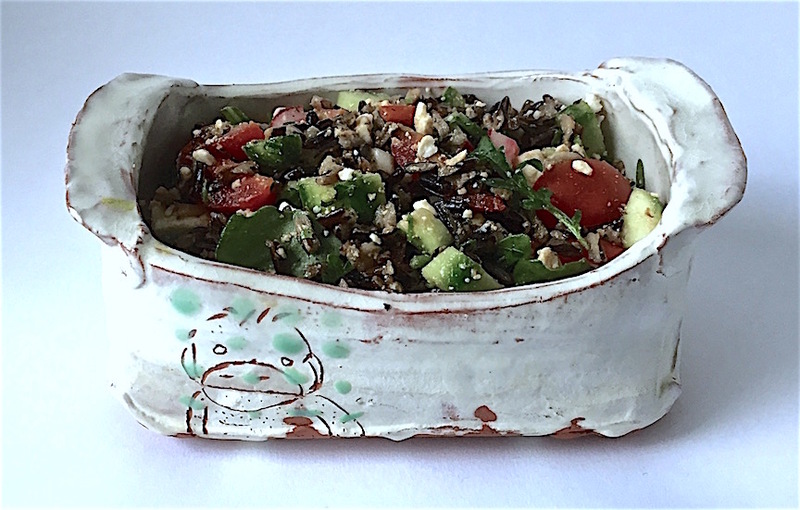 You might think of wild rice as a Thanksgiving food but this salad makes a great summer meal because all you have to cook is the wild rice and then add the other, uncooked, ingredients. Originally, I got a version of this recipe from the Whole Foods website. It is like the one that shows up on their salad bar from time to time. I just varied it to meet my tastes. It is an extremely flexible recipe. 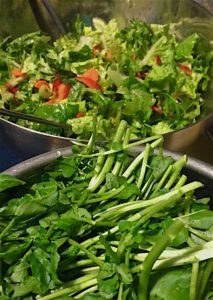 Almost every ingredient in the salad may be substituted for by another depending on season and what you have on hand. No celery, use fennel or zucchini. No red onion, use scallions or shallots. No dried cherries, use cranberries, currants or apricots or substitute fresh berries, cherries or citrus sections. No walnuts, use almonds, pecans or pumpkin seeds. No red pepper, use green, orange or yellow peppers or jalapeños, jicama or leave it out altogether. I had sugar snap peas this week so I sliced some and tossed them in. If you don’t like the raspberry vinegar in the dressing, use wine, pomegranate or sherry vinegar instead. Last week I had some leftover wild rice and I tried a completely different version, essentially rice mixed with a Greek salad minus the lettuce. I added chopped cucumber, radishes, scallions (I didn’t have any red onion), cherry tomatoes, arugula, crumbled feta cheese, oregano and a dash of cayenne to about an equal amount of wild rice and tossed it with a balsamic vinaigrette. It made a very tasty and quite satisfying summer supper plus it held up well for lunch the next day. You could also use the raspberry version as a main course since it contains nuts for protein, or top it with crumbled feta or goat cheese, baked tofu strips, bacon or cooked salmon and plate it on a bed of arugula or lettuce leaves. Wild rice is really a nutritional grass and like true rice, its cousin, it does not contain gluten. It can be blended with brown rice in this recipe, if you prefer a milder flavor or have leftover rice to use up. This salad is quite hearty and will last (and even improve in flavor) for a couple of days in the refrigerator. I often serve it at a buffet supper because it can sit out for hours. Every time, someone asks for the recipe. Serves 6 and keeps well for a few days refrigerated. Cabbage may not be the first thing you think of when planning a meal but it is your friend when it comes to making a winter salad. Especially at this time of year, when you are tired of shredded beets or carrots or kale but you still want some crunch, reach for cabbage instead. Cabbages last remarkably well in cold storage through the winter, providing vitamins C and K and a good amount of fiber when other green (or purple vegetables) are wilted and well past use. Cabbage is delicious sautéed and fermented but can also make a remarkably fresh salad in these early spring months. Cole Slaw is a typical use but shredded cabbage with a vinaigrette is preferable, in my opinion, since it eliminates the use of mayonnaise. 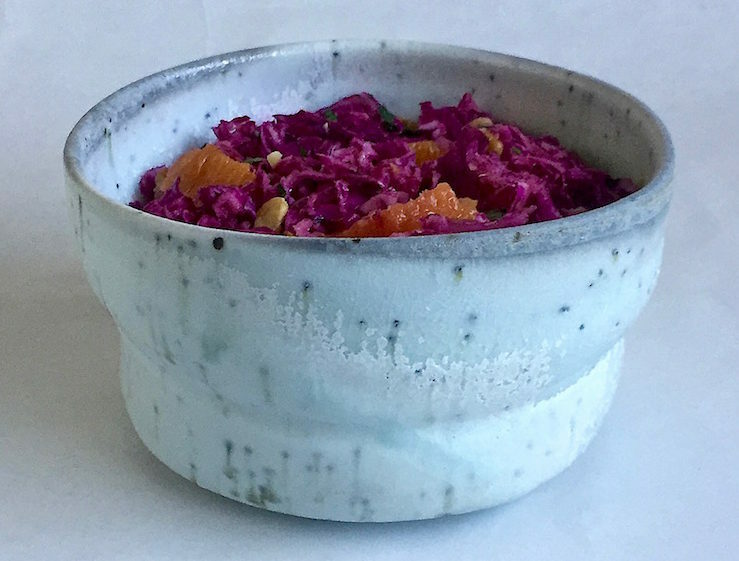 There are wonderful recipes for Indian and Thai cabbage salads with coconut and spices but my perennial favorite is made with orange juice and umeboshi paste, mashed pickled plums found at markets that carry Japanese products. This salad is the decendant of a recipe I learned in one of the first cooking classes I ever took. 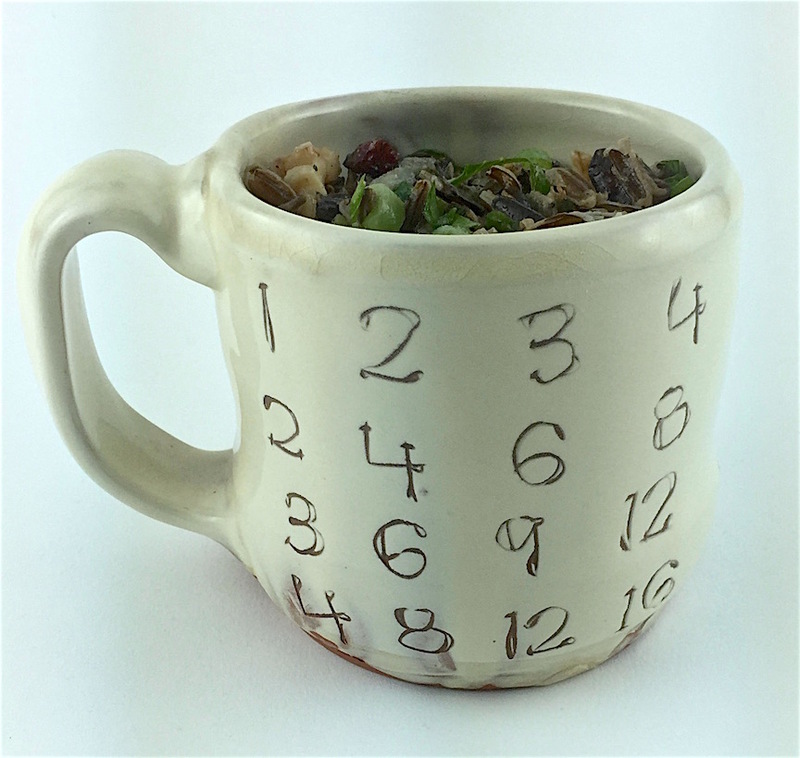 It was created by Minx Boren, who taught at the Natural Gourmet Cookery School in it’s early years and is now a life coach in Palm Beach. Natural Gourmet is a cooking school with a chef-training program focused on healthy eating. It is where I learned basic knife skills, a focus on nutritional balance and how to prepare global specialties from tamales to nori rolls to dosas. 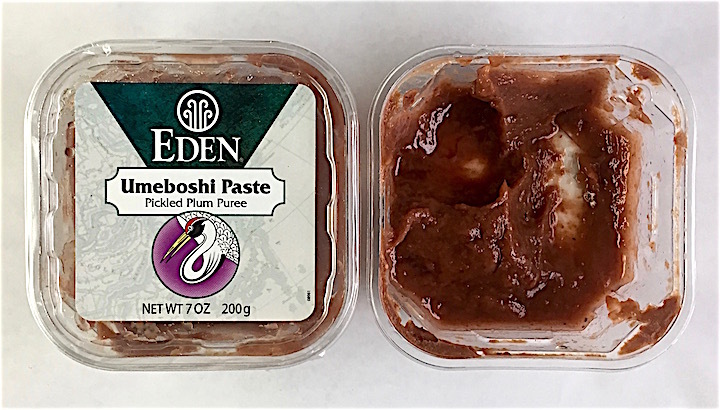 When learning to cook, I thought umeboshi paste and avocado oil were such exotic ingredients and, at that time, you really did have to search them out. Now even Costco sells avocado oil and Whole Foods and Fairway carry Umeboshi plums. 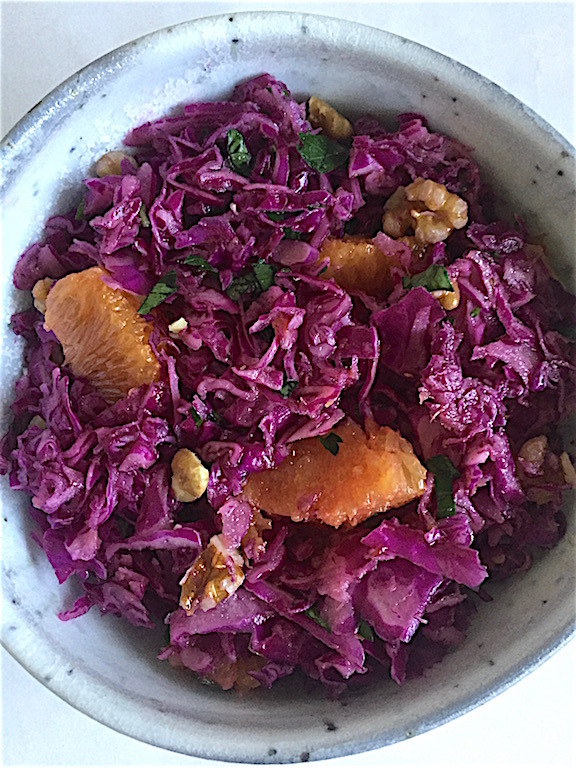 If you really don’t like cabbage or don’t want to use it for some reason, this salad would also be good made with kale (massage it first) or shaved brussel sprouts, fennel or even blanched broccoli, carrots and cauliflower. I have adjusted the original recipe only slightly in proportions, deleted and added a few ingredients. You can adjust it to suit your tastes. If you don’t want to add parley or cilantro, don’t. If you prefer cucumbers or red peppers to carrots, please use them. If you want to add some toasted sesame seeds instead of pumpkin, go ahead. Combining some purple cabbage with the green, or going all purple, will make the salad even more appealing. One of the beauties of this salad is that it tastes even better the second day, after the flavors have melded in the refrigerator, and it holds up well in a lunch box. 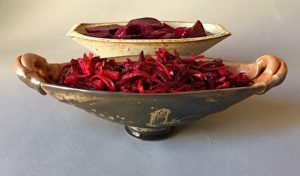 If you find your cabbage tasting too strong or a little sharp or wilted after a winter in the fridge, just soak the shredded cabbage in cold water (before dressing) and it will sweeten and plump up. Toss vegetables with dressing and let marinate in the refrigerator at least 2 hours or overnight. 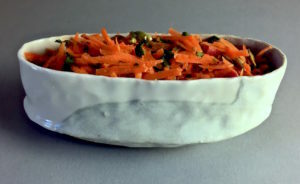 Top with seeds before serving. Eat healthier is always at the top of my list of New Year’s resolutions. For me that means eating less flour and sugar, drinking plenty of water and eating lots more vegetables. Sound familiar? Every January I start off full of good intentions and every year I do a little bit better. When I think about how I eat now compared with years past, there is no contest. There are so many more organic and local options that eating healthy is easier now. Always making sure we have celery, carrots, lettuce and other salad fixings in the refrigerator, leftover greens and some bags of vegetables in the freezer is a sure way to insure I should have no excuses. 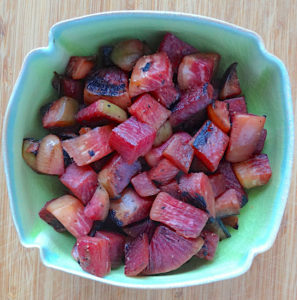 Jicama, watermelon radishes and cabbage are easy to find in January and add crunch and volume to cold weather salads. 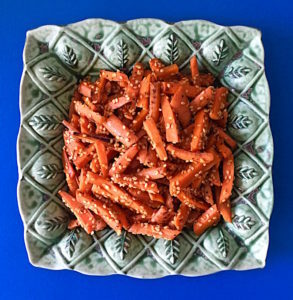 Seaweeds like arame and hiziki can be tossed with julienned carrots and onions and topped with a sesame vinaigrette. 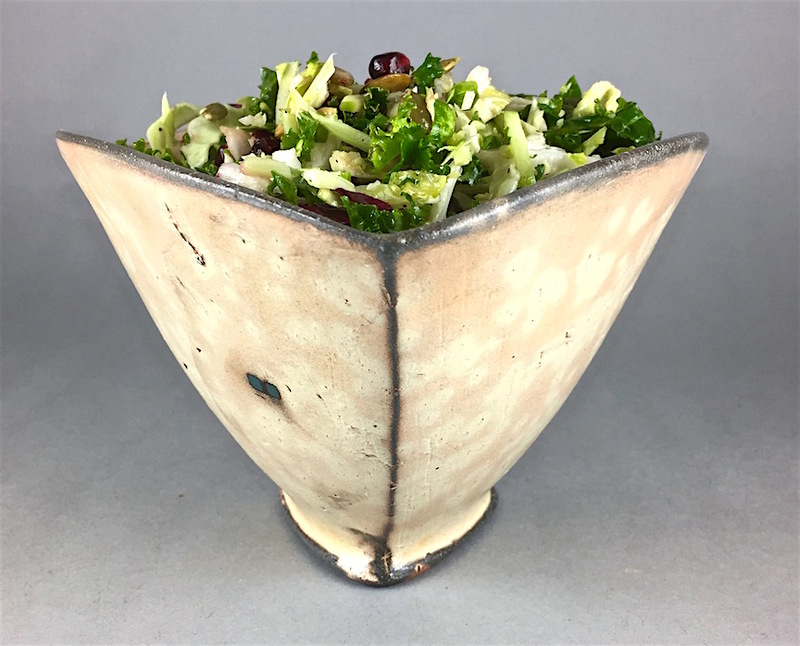 Thinly cut and massaged kale or a bag of arugula is an easy way to add a green salad to your diet any time of year or simply sauté that same kale, arugula, cabbage, watermelon radish or watercress with garlic or onions for a warm dish. 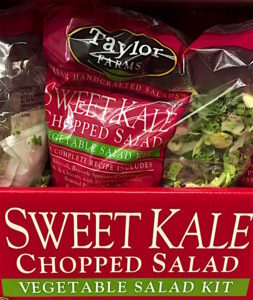 Costco sells a prepared bagged kale salad ready to eat. All you have to do is dress it. The classic winter salad, the Waldorf (apples, celery, walnuts), is usually made with mayo and too creamy for my taste. 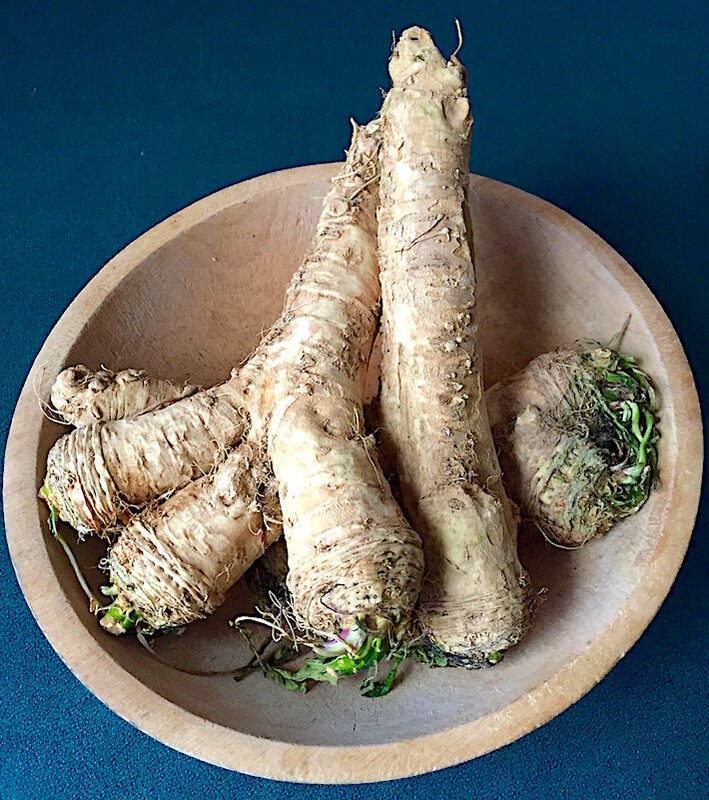 Same thing with celery root remoulade but substituting a combination of yogurt and mustard for the mayo or using a vinaigrette solves that problem in both cases. 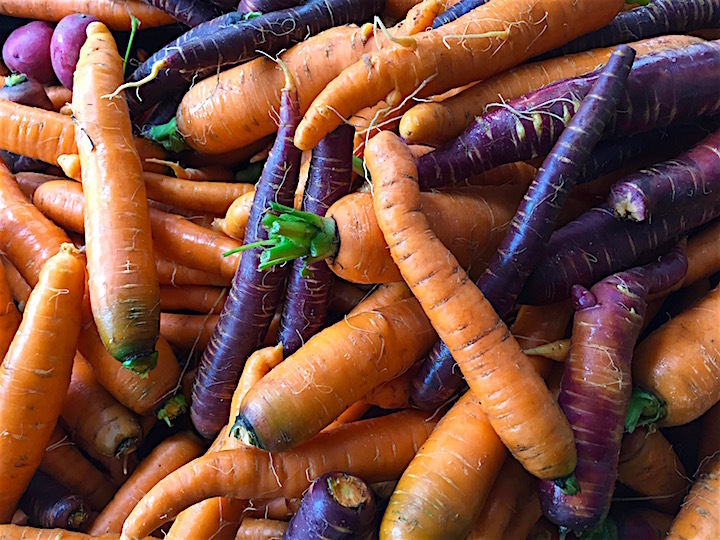 Root vegetables (beets, carrots, parsnips, squash and rutabagas) last a long time (most in the fridge, squash on the counter) and are easy to roast. Leftovers make a great base for salads or poached eggs or can be added to healthy up or substitute for your breakfast potatoes. 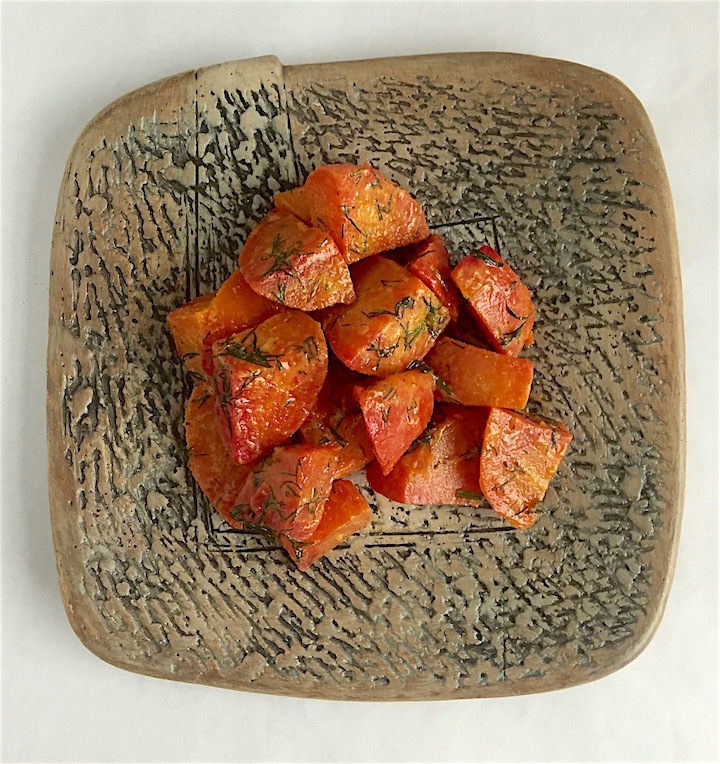 I often make extra when roasting sweet potatoes for supper so I have some left over for breakfast or lunch that week. Making extra veggies, whatever way you are preparing them, will provide you the means for making healthy meals for a couple of days ahead. Another way to up your winter vitamins and minerals is to get in a green smoothie. 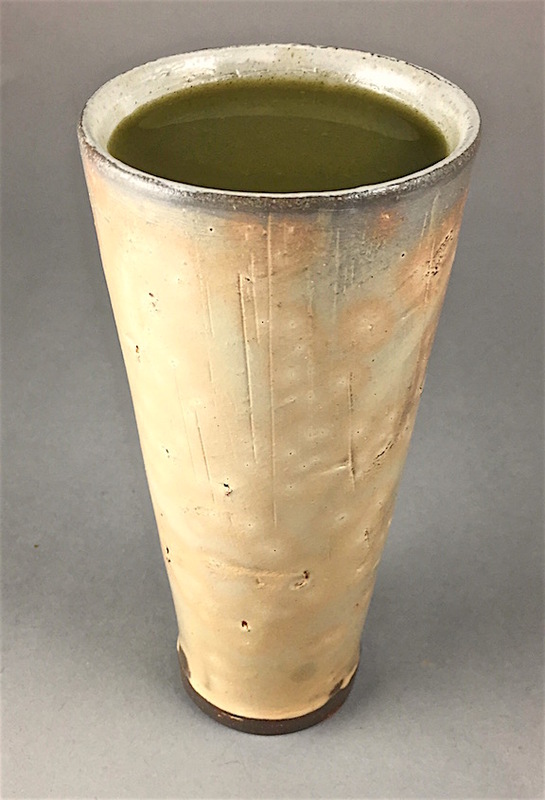 Just toss some greens in your blender alongside an avocado, some frozen fruit and/or yogurt, kefir or nut milk, perhaps upping the protein with nuts or seeds, and you can have a nutritious liquid meal in minutes. Eating better can be the easy part of our New Year plans. Keeping your refrigerator and freezer stocked with vegetables can help that happen.